This path was well marked but a 3 hour long steep climb, if one object could sum up the trail it would be pinecones, these littered the trail from the start and in places made walking a bit hazardous! Parking: At base of trail, nice layby (N28.33.610, W17.51.428). I could have driven further up gravel path if I’d been more daring. 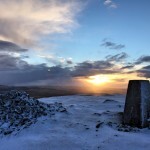 With a 4×4 you could drive within about a 1 hours walk to summit. The trail was not technically challenging but when I reached the top of what I initially thought was the summit, actually turned out to be Montana Negra and with the actual summit still quite a distance (& climb) to go, I hit a bit of a motivation low. I stopped for a break, a mental re-group and some water. Plan of attack was to put in the earphones and listen to some motivating Drum & Bass music in the form of Etherwood; this provided a fast but instrumental and natural soundtrack to some pretty impressive scenery and the final ascent. By the time I got to within spitting distance of the summit it was hard to stand up due to the wind and you couldn’t see anything due to thick cloud rolling up one side of the summit and then down the other side. This happens most days on the summits of La Palma, during the morning the trade winds bring in the cloud which build at the side of the summit & then by early afternoon it rolls over the top and down the other side causing what they term a “cloud cascade”. From a distance this is stunning, but when you’re in it it’s cold, damp & severely restricts visibility; this made the final ascent around the steep caldera trickier than it had to be, one slip would see me falling down into a steep 100-200m deep basin! This provided enough shelter to keep the worst of the wind off, but the layers, coat and hat remained firmly in place. The gloves only came off due to setting up & logging! I setup the vertical in a slightly sheltered place (see pic above) to prevent the wind from battering it severely and anchored it with 3 rocks on the tripod base, I did this on every activation, but paid special attention here as the wind would of easily blown it down into the caldera pit. The activation zone is narrow, with the summit face on one side and the caldera drop off on the other, with the path running straight through, it made placement of radials a bit tricky. I didn’t fancy getting too near to the edge of the caldera which saw some radials hastily chucked down the slope, trying to get them as straight as possible without a chance of me going down to straighten & stake them out! Once again I was thankful for the small footprint of the vertical antenna, there’s no way a 10m mast and linked dipole would have stayed up in the wind, even if I had managed to guy them into the solid rock/gravel! 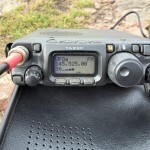 I started the activation on 10m and while checking to see if the frequency is clear, Karl (M3FEH) responded to me. 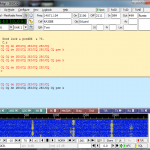 It seemed he’d been waiting and that my 10m frequency selection had become predictable (no bad thing!). Karl spotted me, which saved me some SMS pennies (actually only 5p per message from EA8 back to the UK, quite reasonable really) and I was in business. Phil (G4OBK) made it into the log several minutes later, followed by GB2IWM (Colin – G8TMV – operating from the Imperial War Museum in Cambridge) who caught me on a further two activations while in EA8. A Summit to Summit (S2S) with Ed (DD5LP/P) on Hohenkarpfen (DM/BW-074 – worth 10 points) was the highlight of the session as we had planned to do this on the SOTA reflector, but weren’t sure if our activations would align. It all worked out as expected and we were able to complete the QSO while the anxious chasers stood by, well most did, with the usual alligators making the neccesary exchange longer than it had to be! I got two further S2S contacts in with Marko S57MS/P and Bojan S56LXN/P, both activating together on Spilk (S5/KS-043 – 4 points). 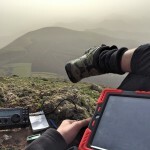 I think this could well be the first ever EA8 to S5 S2S in the history of SOTA? With the vertical adjusted and optimised for 15m I sent out an SMS spot, this was followed up very shortly by Mike (G6TUH) and then Don (G0RQL) a short second – these two chasers are always quick off the mark and with very efficient directional antennas and my ears somewhat attuned to their callsigns (after 29 and 25 QSOs respectively) they crack the pile up quite easily! A whole slew of the usual European chasers followed, with another Slovenian ham (S56IHX) getting in the log – not sure what it as about this summit, but I didn’t make any other QSO’s back to Slovenia on any other summits! A hat trick of North American chasers, AE4FZ, NE4X and W8IZC made the log in a row as well. After 52 QSOs and 1.5 hours on the cloud and wind infested summit I had gotten surprisingly cold and reached my limit. I packed up rapidly, imagining the sun soaked and wind free path beneath the summit, while noticing the vertical was wet with moisture collected from the clouds passing through. The cold and discomfort onset was rapid and without much warning or at least I didn’t notice it while busy making runs of QSOs! I descended as quickly as possible as the strong wind and poor visibility would allow for and after 15 minutes I was beneath the cloud and away from the worst of the wind… the layers, hat & gloves came off rapidly in the warmth! While the conditions on the summit were pretty awful and the view non-existent being inside a cloud the activation was most enjoyable. 52 QSOs made with three S2S contacts and 7 QSOs to North America ensured I was happy with the activation. I’m sure that on a clear day or with a morning activation the view from this summit would be spectacular! To my amazement, a day after this activation I received an email from Glenn (VK4FSCC) down in Australia to say that he had heard me on the summit but couldn’t break the European pileup. Gutted! Thanks for the new SOTA James. It was great working you from 5 different ones on 10m phone during your vacation in the Canary Islands. Love your blog & write up of the different activations. Your doing an incredible job. Keep up the great work !